Bob Marley is now one of the world’s most famous musicians. For a guy who generates the fourth-highest income of any late musician, however, many aspects of his career and life remain murky. That’s particularly true of his first ten years or so as a recording artist, predating the Wailers’ first release on Island Records, the early 1973 album Catch a Fire. From that point until Marley’s death in May 1981, his music and other activities are fairly well if imperfectly documented, as he was constantly in the media spotlight and his records were easily available in Europe and North America. 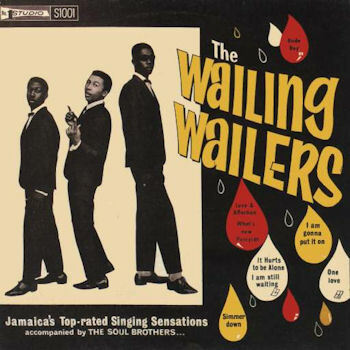 The Wailers’ first LP, mid-1960s. But from the time of his 1962 debut single “Judge Not” until he hooked up with Island, Marley’s records (almost all of them recorded as part of the Wailers) were largely unknown outside of Jamaica, as were the Wailers themselves. The Jamaican record business was not exactly big on documentation, and many early ska/rock steady/reggae reissues (including many of those by the Wailers) have frustratingly scant annotation. Such crucial information as recording and release dates often seem to be treated as closely guarded state secrets. As the Wailers weren’t given much attention by the Jamaican media (and virtually none by the non-Jamaican media) at the time, the same holds true for their activities outside the studio. It’s hard to piece together what happened when, and even the most thorough Marley biographies frequently report different dates and sequences for the same events. This and the next couple posts present some of the Marley mysteries that I find most interesting (and sometimes, considering how confidently wildly varying accounts of these issues are presented as fact in multiple sources, irritating). 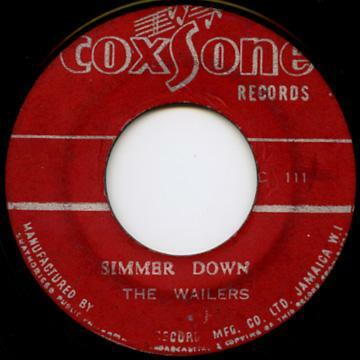 Let’s start with the very first Wailers single, “Simmer Down,” a hit in Jamaica in – when? The liner notes to the 1992 Marley box set Songs of Freedom—probably one of the highest-selling box sets of all time, having gone double platinum—state that “Simmer Down” “was a number one in Jamaica in February, 1964.” Yet according to Roger Steffens and Leroy Jodie Pierson’s Bob Marley & the Wailers: The Definitive Discography, it wasn’t even recorded until July 1964. The guys who wrote this aren’t just assigning dates on a whim; Steffens is probably the most respected reggae authority in the world. This shows “Simmer Down” at #5, up from #10 the previous week (and #15 the week before that), which indicates it was probably a relatively recent release still on the rise. It’s doubtful it would be jumping from #15 to #10 to #5 after having been #1 in February. Later in September it got to #2, gradually falling lower in the Top Ten over the next couple months, judging from a few other charts on this website. It’s also doubtful it would have been held from release for a long time after it was recorded, so the July 1964 recording date is likely accurate, even though some accounts have the Wailers starting to record as early as 1963. This leads into some larger issues not only in accurately assessing the Wailers’ commercial success, but also in the history of ska and early reggae’s popularity in Jamaica in general. There seems to be no source for which chart positions of Jamaican singles in the 1960s and 1970s can be easily consulted. I threw out the question as to whether Jamaican chart positions could be looked up anywhere to a large newsgroup to which I belong of many esteemed UK music journalists (I am from the US but an honorary member of sorts). None of them replied. There’s not even agreement on what the national chart, or national charts, were. 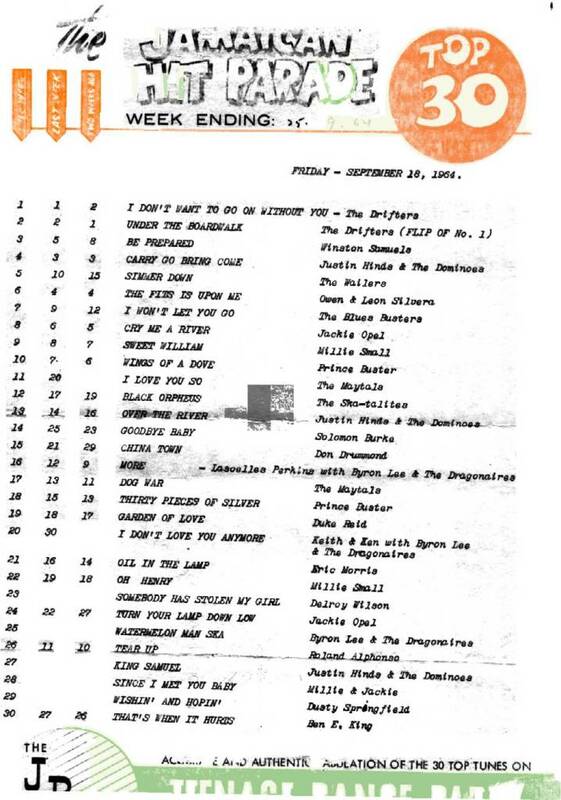 This chart was compiled by “JBC—Radio Jamaica.” JBC was the public radio station the Jamaica Broadcasting Company. Radio Jamaica is the name usually given to RJR, or Real Jamaican Radio. Was this chart a composite of what was most popular on both stations? Were there other charts? 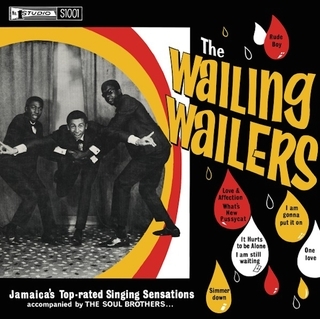 Another cover used on the Wailers’ first LP. It should be noted that charts, in Jamaica and elsewhere (including the US), are not gospel as to what records sold the most, were played the most, or were generally the most popular. Measurements of record sales have always been inexact—more so back in the 1960s and 1970s, before SoundScan made tracking sales at least somewhat more of an exact science. Chart positions, although the industry doesn’t like to discuss the fact, have sometimes been influenced by financial considerations some might view as payola. Nonetheless, chart positions, for all their flaws, are the best indications we have of how generally popular releases were. Singles throughout the Wailers’ first decade are given different chart positions, or different descriptions as to how popular they were, in various different sources. As a chart that seems like the same one as the JBC-Radio Jamaica chart whose Top Ten was reprinted in Jamaica’s major daily paper (The Gleaner), it seems like someone could or should go through those back issues and compile an actual reference publication or database with the peak positions, at least for Top Ten entries. Not a job anyone’s likely to pay someone for, I admit, but one that would be highly useful to historians in more precisely establishing how successful the Wailers were in their early years. “Simmer Down” has been reported, by the way, to have sold about 70,000-80,000 copies. As Jamaica had a population of a little less than two million, that would have been the equivalent of selling about five million copies in the US. I have no way of confirming this, but I have the feeling that figure might have been somewhat inflated. If we’re playing the equivalence game, even the Beatles’ “I Want to Hold Your Hand” didn’t sell five million copies in the US that year. Was “Simmer Down” really more popular per capita in Jamaica than “I Want to Hold Your Hand” was in the US? It’s sometimes stated in Marley/reggae literature that reggae was not played as often as it should have on Jamaican radio, or even that it was seldom played. But early reggae singles occupy most of the places on this chart. There are a few American soul 45s by the Drifters, Solomon Burke, and Ben E. King, and one British Invasion disc—not by the Beatles or a rock group, but by Dusty Springfield. Other charts from the ‘60s and early ‘70s on this Peter Tosh website are dominated by reggae (if not quite as much), with similar sprinklings of American soul and the very occasional UK pop hit. Could reggae really have been played rarely on Jamaican radio? A student of mine who visited the island in the late 1970s said he indeed hardly heard any reggae on the airwaves when he was there; was there that much of a disconnect between the charts and the radio playlists? Going by the charts (which cover only a very small portion of the years 1964-1972) on the Peter Tosh site, the Wailers did have a good number of Top Ten singles during these years—and probably a good number of others that don’t show up on the scraps of charts the site managed to locate. This didn’t seem to make them rich, though predictably, even accounts as to how poor or well off they were widely vary. Which leads into more Marley mysteries, as continued in the next post. 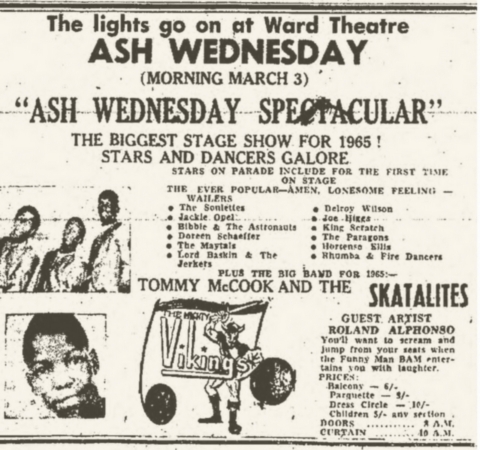 One of the few surviving posters for an early Wailers concert, from March 3, 1965.
thank you for the research that you have put into this project. It’s about time someone has attempted to suss out this history.